We met in Kathmandu. There were six of us – all women. 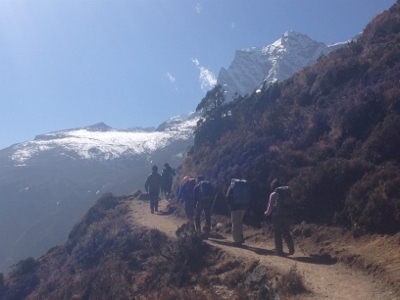 In November 2014, we came together to trek to the “hem of heaven” Mt. 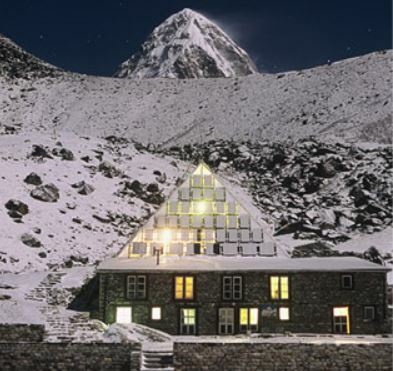 Everest’s Base Camp at 17,598 ft, also known as “EBC”. None of us were mountaineers or serious trekkers. Some of us had been on multi-day treks, and others had only been on day hikes. 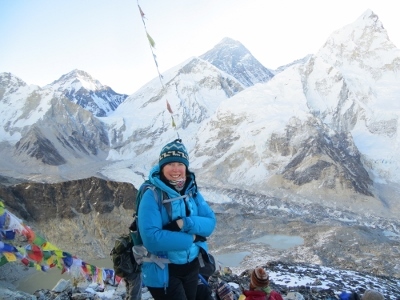 We shared an “adventuress” streak – a sailing captain, a brewery owner, retired school teacher, entrepreneurs with one common goal…to trek to Everest Base Camp. We had been training for months leading up to this trek with day hikes, long runs, and other cardio activity. 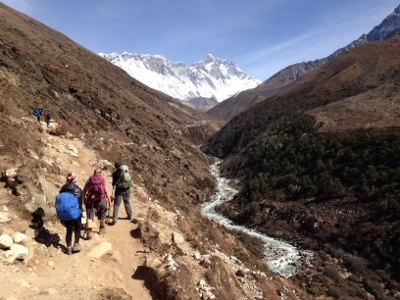 But none of us really knew what we were in for until we took our first steps on the EBC Trail. We were excited for the adventures awaiting us on this 14 day trek. Here’s a day-to-day overview of our journey. 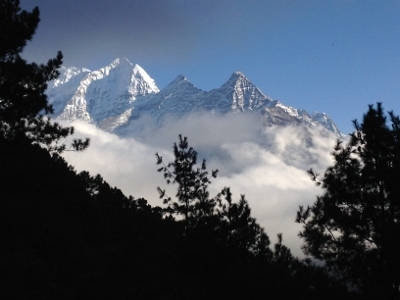 Today we flew from Kathmandu to Lukla, a foothill town where trekkers from around the world began their journey to EBC. The flight to Lukla is approximately 30 minutes and a bit bumpy. 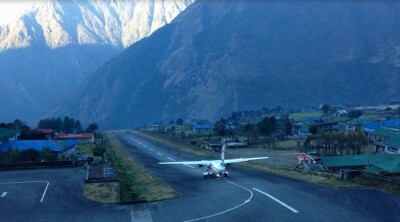 It concludes with a dramatic landing at Lukla’s short airstrip, famous for running uphill into a cliff face. Known as one of the world’s most dangerous and also busiest airports with up to 50 flights per day. Originally built to ferry goods for Sir Edmund Hillary school project with The Himalayan Trust. 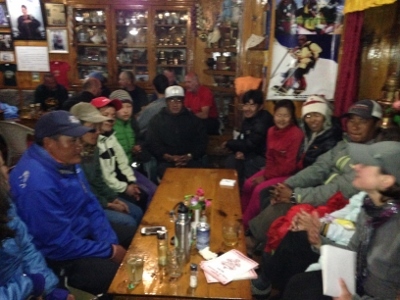 In Lukla, we met our trekking staff of porters, assistant guides Khongdu & Pima, and lead guide Monju. 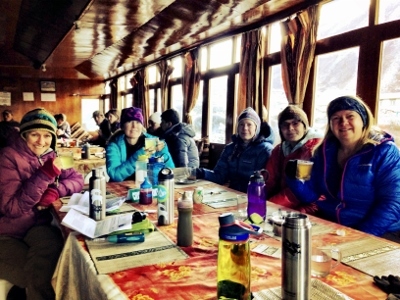 We had a local tea together and then headed off on our 3-4 hour trek to Phakding. The trail was fairly level terrain along the Dudh Koshi (koshi means river in Nepali). Mt. Everest is the “King/Queen” of Mountains standing at 29,029 ft. within the Sagarmatha National Park, a UNESCO World Heritage Site. 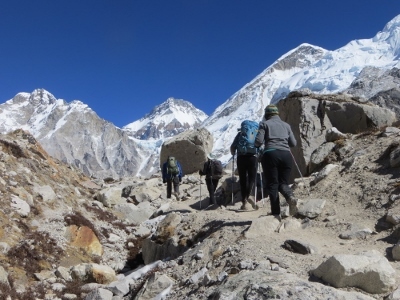 Everest, Lhotse, and Cho Oyu Peaks are known worldwide for its magnificent landscape of high mountains, glacial valleys, alpine grasslands, birch and pine forests. 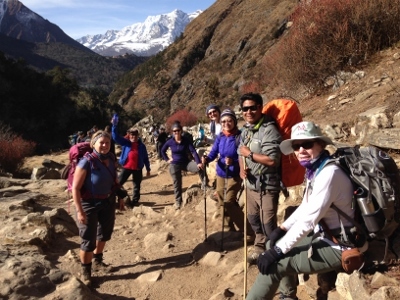 We were excited to begin our trek, and left Lukla, descended to Chaurikharka and continued to Choplung at 8,910 ft. We past quite a few trekkers returning to Lukla having completed their EBC trek. By the looks of their clothes and gaunt faces, our imaginations left us wondering what laid ahead of us. We must have looked like the new trekkers with our clean clothes, enthusiasm, and big smiles. We continued on our descent to Thado Koshi, a settlement named after the stream flowing through it, then around a ridge to Ghat. 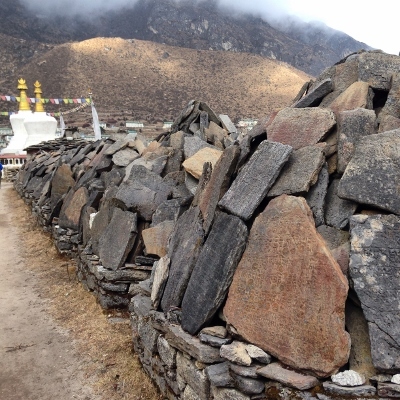 Along the way, there were monasteries, numerous prayer wheels, mani stones and choorten at Ghat. 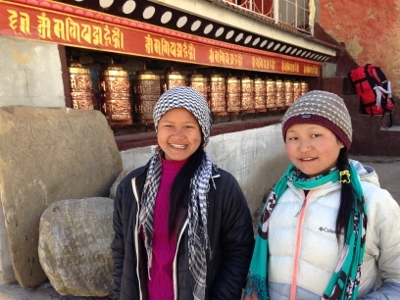 Trekkers joined locals in turning prayer wheels in a clock-wise direction,walking on the left side of shrines and manis to keep to local traditions. From Ghat, we trekked another 20 minutes to Phakding and we checked into a mountain lodge for our first night. 1. Get out of wet clothes and into dry clothes! Wash any undies, base layers & take a quick “bird bath” before the sun sets. Find a place to dry your clothes. If not dry by the next day, hook them onto a carrabiner and latch it onto your daypack. The sun rays should dry them within a few hours. 2. Set up your sleeping bag and prepare gear for next day. 3. The rooms aren’t heated, so most of us head for the main lodge room where the wood or “yak dung” burning stoves kept the trekkers and porters warm. 4. Get the Steripen out or GRAYL water filtration press ready to filtrate your water. Fill up camelbacks and water bottles for next day’s trek. We filtered about 3-4 liters per day. Water is your best friend when you hike to higher altitudes. 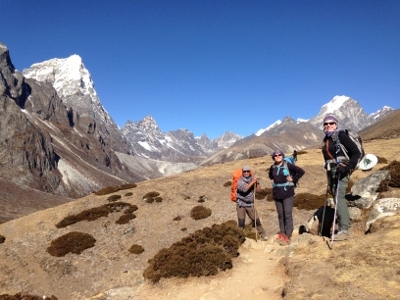 Hydration is one of the key reasons why some trekkers don’t get altitude sickness. 5. Hang out til dinner and meet other trekkers, order popcorn, record thoughts in your journal, play cards, or get the map out and look at the trek for the next day. 6. Head to bed early – most of us fell asleep by 8pm if not earlier! Our trekking days start early, with breakfast at around 6 am, and onto the trail about 7 am. 7. Keep your headlamp, flashlight near your bed (and roll of TP! ), since you most likely wake up and find your way down a dark hallway to a squat toilet at least once in the night. We followed the Dudh Koshi to the village of Monjo at 9,350 ft, beyond which is the entrance to the Sagarmatha National Park. We had lunch at Jorsalle at 9,300 ft. Some tried the yak-cheese pizza, others had vegetable fried rice, dahl bat (lentils & rice), and french fries. We burned most of this off on a long & steep switchback trail to reach Namche Bazar. The trail passed through a pleasant pine forest, and got our first views of Mt. Everest. At the top of this steep trail, the vista opens up into a panoramic view of the bustling village of Namche. 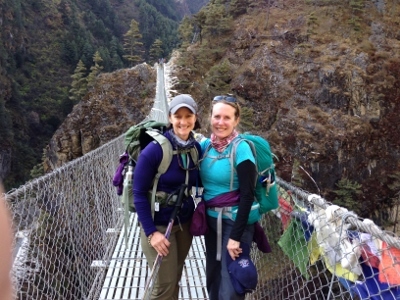 We trekked a total of 2,570 ft elevation gain, and crossed a few suspension bridges. 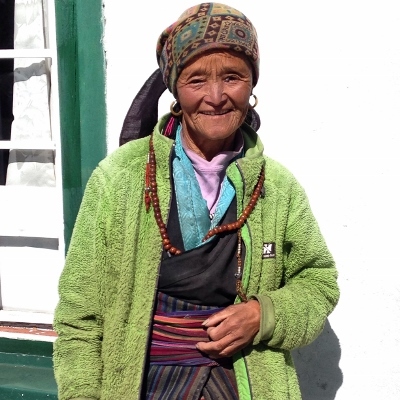 As we hiked through villages, we met local Yeti mountain people. We started to feel the altitude change, and continued to stay hydrated. Our guides reminded us to climb up slowly, one step at a time. Some of us choose to start taking the high-altitude medicine, Diamox. We wore our ExOfficio zip-off pants and quick-dry tops. Our trekking team & guides drank Nuun with electrolytes to optimize our trekking stride. We stayed in Namche one extra day to get acclimatize, which meant climbing up to a higher elevation, and then returning back down to Namche to stay the night. 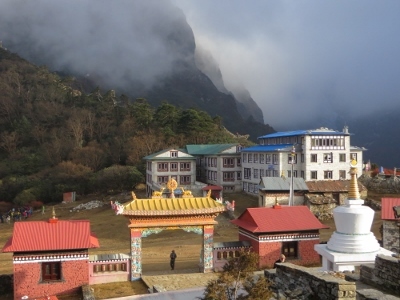 There’s lots to do in Namche. We awoke for an early sunrise hike up to the Park Headquarters at Mendalphu, and saw incredible vistas of Mt. 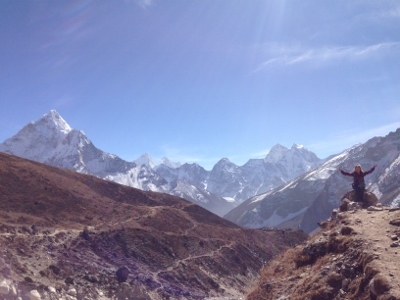 Everest and the surrounding Himalayan peaks – Nuptse, Lhotse and Ama Dablam. 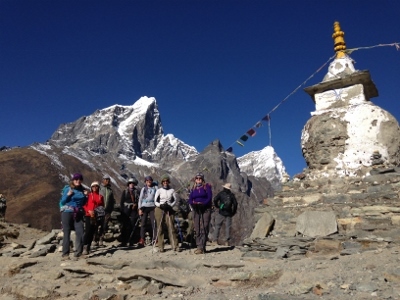 We climbed up the a steep “hill” to Syangboche at 12,450 ft, and further up to the Everest View Hotel for a noon tea and snack. The outdoor dining area is like no other with excellent views of the Everest range. When we returned to Namche, we stopped by the Namche Bakery for freshly made cookies, cakes and tea, then returned to our lodge to get ready for the next day. We had a hot “1 bucket” shower in Namche knowing it might be awhile…10 days…before our next shower. 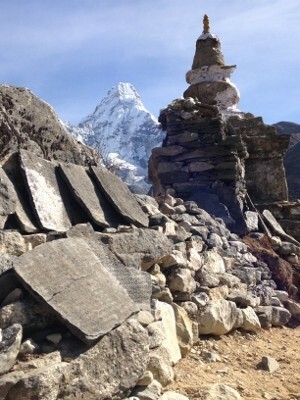 We left our warm North Face sleeping bags, and got ready for the trek to the top of Namche Bazaar. Our group started the day walking up the steep steps to the top of the Namche village, then took a turn onto a fairly level trail to Kenjuma and Sanasa at 11,830 ft. The trail then descended to the Dudh Koshi which must be crossed to reach Phungi Tenga at 10,700 ft.
After our lunch rest stop, we had a grueling afternoon climb uphill for 3-4 hours through conifer and rhododendron forests to the monastic small village of Tengboche. 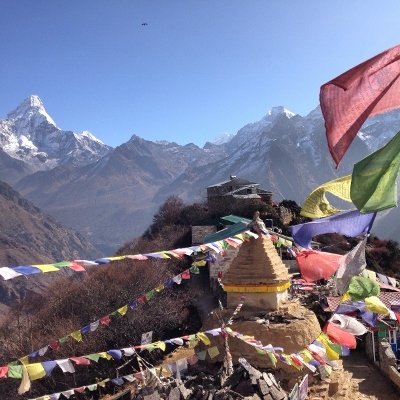 We trekked a total of 1,620 ft. today and arrived to Tengboche. 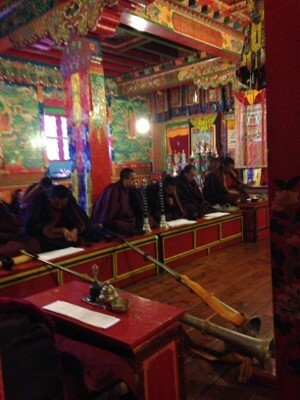 Once we arrived to the lodge, we got settled in our rooms, then headed to the monastery for an sunset ceremony. We watched the monks perform prayer ceremonies and were mesmerized by the incense, chants, and musical instruments – chimes, trumpets, gongs! We dressed like “onions” with layers of Marmot, North Face, and Columbia Sportswear clothing so we could adjust to the weather – layering down when the sun was out, and layering up when the temperatures dropped and winds picked up. 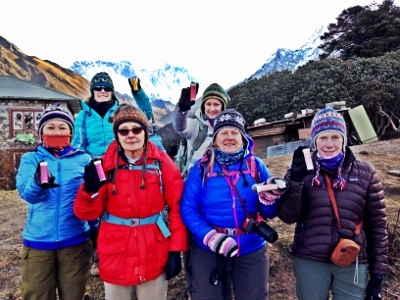 Our trek team raised our Nuun tablets to acknowledge that Nuun gave us the extra energy we needed to reach Tengboche. Thank you Nuun! 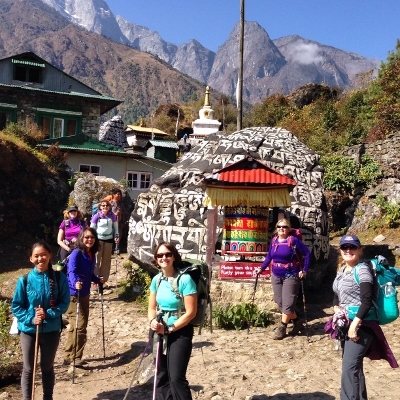 We woke up at 6:00 am and geared up to trek 1,000 ft in elevation gain to Dingboche. The trail descends steeply to the small village of Debuche. Quietly tucked into a forest grove is a Buddhist nunnery. 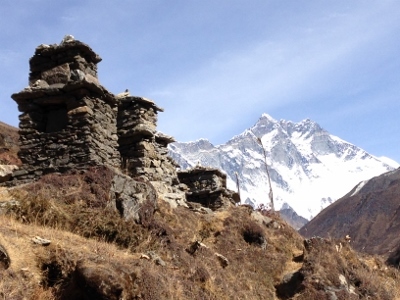 Past Debuche, we crossed the Imja Khola and climbed to the village of Pangboche at 12,800 ft.
After lunch, we hiked to the end of the village where the trail climbs to the settlement of Shomare, and then to Orsho. 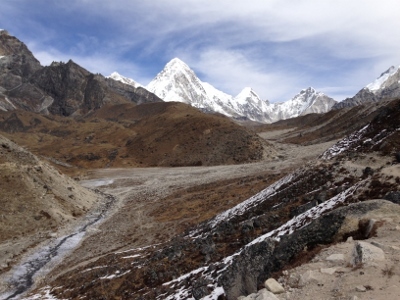 At this point, the trail divides – to the left, Periche and to the right, Dingboche. We veered to the right, and our destination for the day was a picturesque alpine village situated beside the Imja Khola with incredible mountain views. Today, we noticed a drastic change in the landscape: evergreen forests that gave way to dry scrubland of dwarf bushes and grasslands. Today is our second acclimatization day – time to catch our breath. But not for long, since we took an “acclimatization hike” where you ascend approx. 1,000 ft. and then descend to sleep for the night. 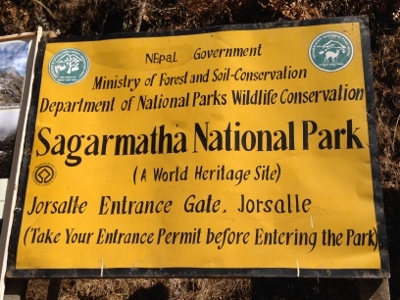 This is critical to our successful trek to Everest Basecamp. 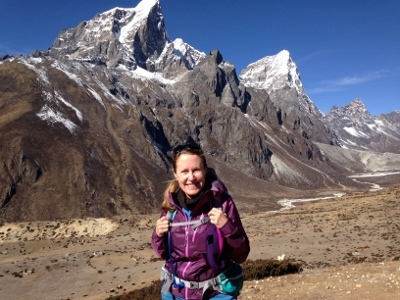 We heard stories about other trekkers who didn’t take the time to acclimatize, and as a result never made it to Everest Basecamp. 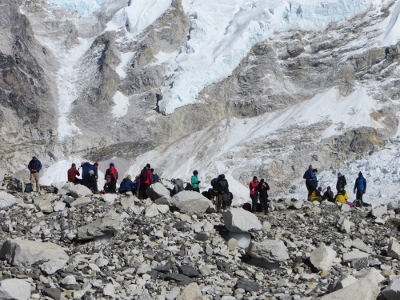 Some trekkers with altitude sickness descended immediately, while others were evacuated by helicopter. We climbed up to the chhorten on top of the ridge above the village, and walked around the village. 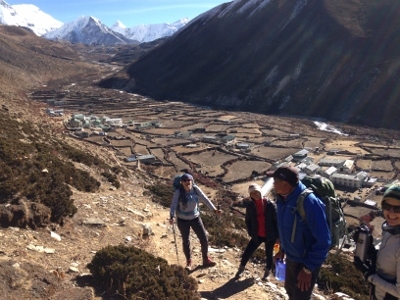 Every day, we have been inspired by the towering Himalayan peaks, picturesque Sherpa villages, sacred Buddhist monasteries, and kind local people we are meeting on our trek. Today we trekked to 15,100 ft! We are now higher than Mt. Rainier (14,409 ft.), in our hometown of Seattle, Washington, USA. After trekking along a gradual incline across the top of the glacial moraine above Pheriche Valley, we continued across a few yak pastures, and small stone huts. 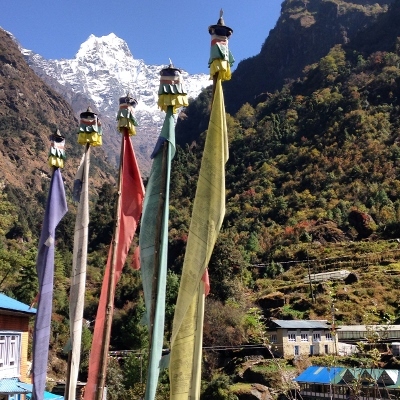 We arrived to Dughla, a small hamlet near a glacial lake and mountain pass south of the Khumbu Glacier. Once again, we are blessed with crystal blue skies, however the nights are getting colder and colder. 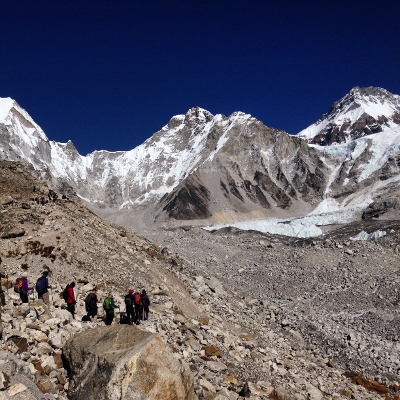 Only 2 days til we reach Everest Base Camp – almost there. 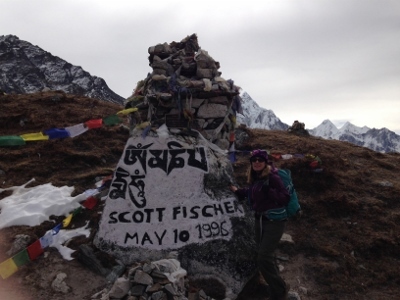 We climbed directly up a trail on the terminal moraine of the Kumbu Glacier into an area with tributes to climbers who have perished on Khumbu’s mountains. 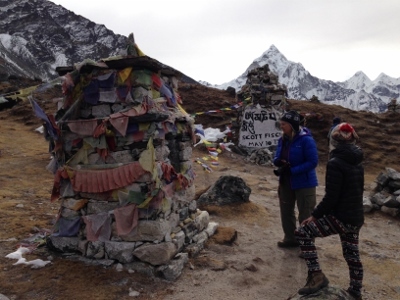 Past this point, it is a very gradual incluine all the way to Lobuche. 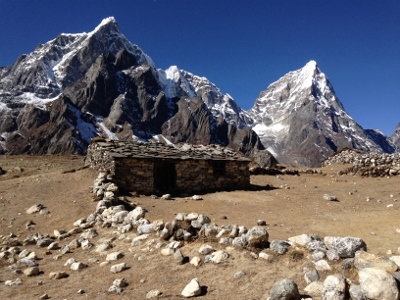 Lobuche is a small settlement and one of the last lodging stops for Everest trekkers. 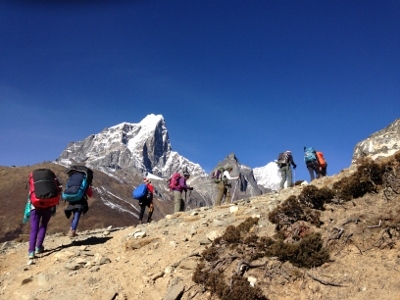 After we settled into our lodge, some of our group trekked up to the Italian Research Center for Global Climate Changes, and others hiked up one of the ridges above the villages for excellent views of Nuptse and Lhotse. Tomorrow we reach Everest Base Camp! Has it really been eight days on the trail? We are getting very excited to finally get to the foot of Everest. Staying warm in layers of Marmot, Outdoor Research, North Face and Columbia Sportswear clothes. Today was a long day. 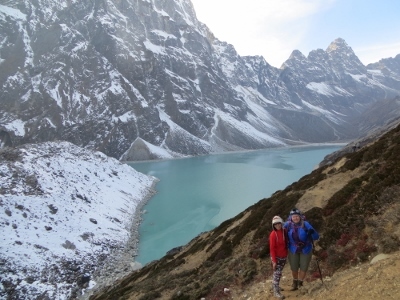 We started trekking from Lobuche and ascended gently through alpine meadows. Then crossed several steep moraines while also walking on an “active” glacier. 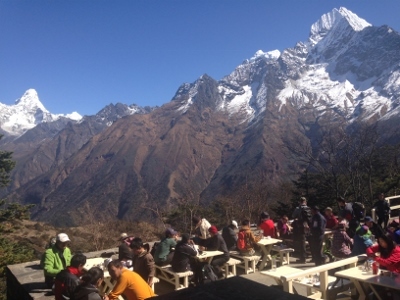 We had lunch at Gorakshep, the hub for all Everest trekkers, situated on a sandy and flat section that served as base camp for the 1952 Swiss Everest Expedition. After lunch, we trekked a couple hours and made it to base camp! 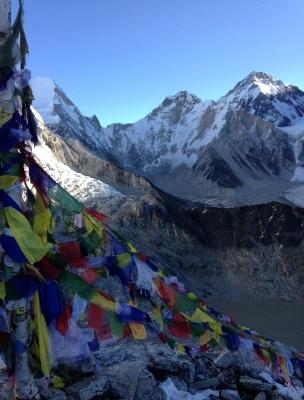 From here, we looked up at the highest point on Earth – the Summit of Everest. After taking photos, we headed back to Gorakshep before it got dark and we would lose the warmth of the sun. In April – May, there is a sea of tents here where daredevils will stay before attempting to summit. These skilled mountaineers will climb ice falls, walk on ladders to cross deep crevasses. The roar of avalanches, freezing hurricane force winds remind all of us to respect nature, and wait til the right time to summit. 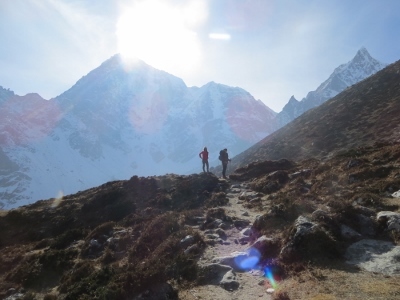 More than 4,000 have summited since Sir Edmund Hilary & Sherpa Tenzing Norgay’s 1st ascent in 1953. Hundreds have perished. 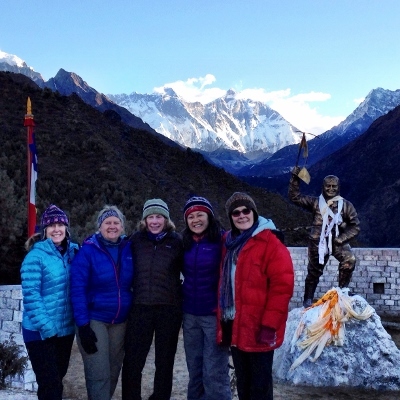 Early this morning, at 4:30 am with freezing temperatures, a couple of us decided to hike up to Kala Patthar (18,300 ft.) to get spectacular views of Everest and its surrounding peaks. The 1,100 ft. steep ascent was highly challenging! But every step was worth it since Kala Patthar serves as one of the best unobstructed view-points for the southern massif of Mt. Everest. After this morning trek, we met up with our group for breakfast, then left Gorakshep to descend to Pheriche Valley at 14,340 ft. HUGE thanks to our “weather God” Michael Fagin of www.EverestWeather.com for providing us real-time weather updates throughout our trek. Today we continued our descent, with some ascending uphill climbs, from Pheriche to Phortse, one of the most populated Sherpa guide villages in the Khumbu region. Along our hike to Phortse, we stopped at a village for lunch and watched how “Mo Mo’s”, Nepali dumplings or potstickers, are made. While trekking, we met some of the villagers and learned about their daily routines. 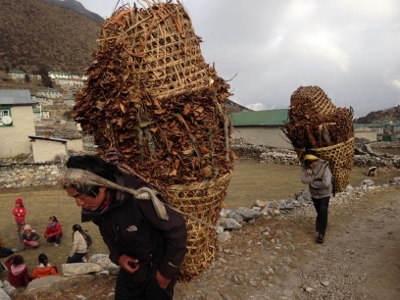 Along the trail, we saw porters and yaks carrying everything from building materials, propane, chickens, chairs, etc. 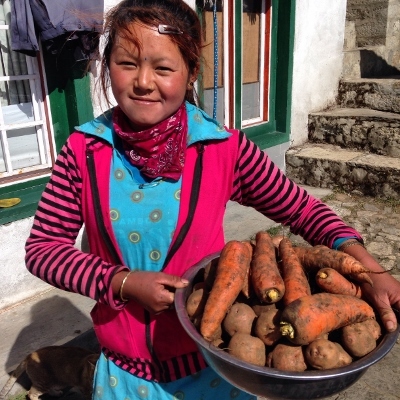 We stayed at a lodge in Phortse that is owned and managed by Sherpa Kanchha Nuru and his wife. 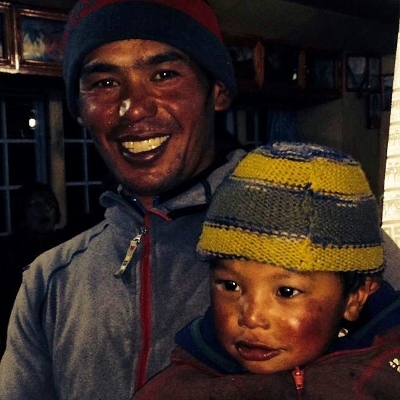 Sherpa Nuru has summited Everest 7 times and told us his primary motive is to serve the clients and ensure their safety. We descended to the Dudh Koshi River and ascended to Mong Danda. 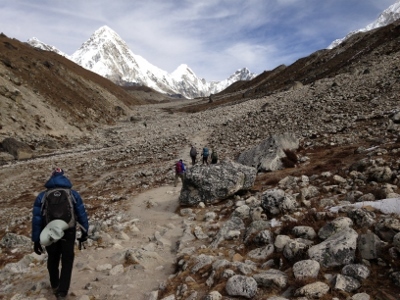 Followed the slopes of Khumbila towards the picturesque hidden valley of Khumjung. 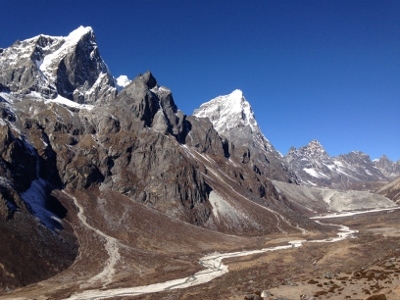 There are two contiguous Sherpa settlements in this valley: Khumjung and Khunde, which provide more Sherpa guides to Everest climbers. We met local Sherpa families, learned more about how they live, the challenges they face, and where they find their simple joys. Also, we stopped to visit the Khumjung School, a building constructed by Sir Edmund Hillary himself with all its parts brought in from New Zealand. The adjoining village of Khunde, hosts the Khunde Hospital also made possible by Sir Hillary. Note: Of Nepal’s 28 million people, only 152,000 are Sherpas, a mountain tribe that crossed from Tibet to Nepal hundreds of years ago. 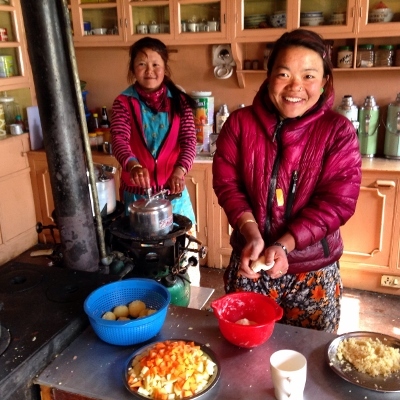 Their main income comes from farming and guiding Everest trekkers. Today is our last trekking day as we depart Phakding for Lukla. 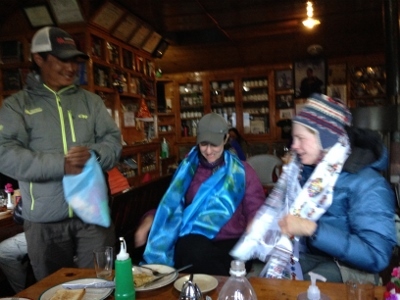 Our guides gave us the Nepali farewell scarves and we toasted to their patience and perseverance to help us successfully reach Everest Base Camp. We were thrilled with 14 days of blue sky weather and crossed our fingers, eyes, and toes that the weather would hold out for our departing flight from Lukla to Kathmandu. Our group had heard from others about their experiences of getting stuck in Lukla and occasionally it took up to a week to get a flight out. Flights had been delayed for the past two days, and we could sense the level of desperation when our own flight had been delayed. Almost an hour went by until we saw our plane land to pick us up. 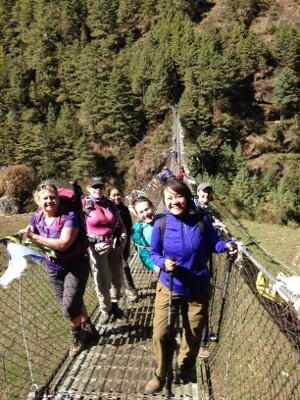 As we flew out of Lukla, we realized how much each of us had been challenged individually and as a group. We had been stretched in every way – physically, emotionally, mentally. 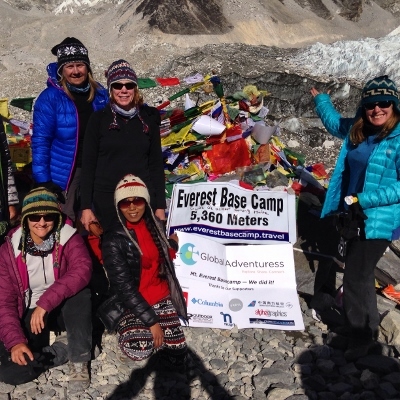 Everest Base Camp bonded us forever. Every step was worth it. 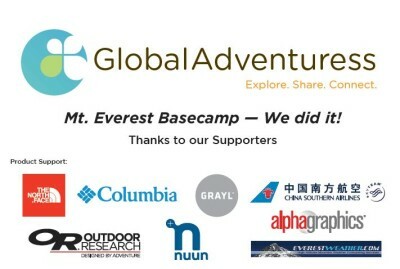 The following companies donated products & services that were used by the trekking team. 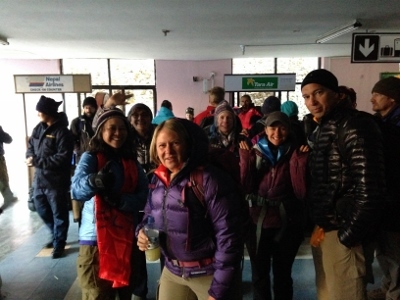 Several clothing & gear items were donated to the Sherpa guides and porters post-trek. China Southern Airlines provided us with the best value and most direct flight from North America to Nepal. 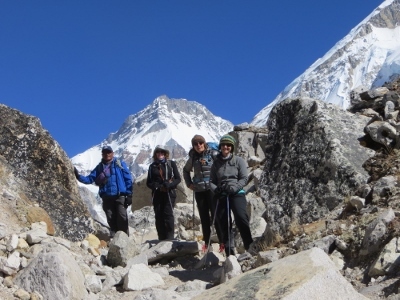 From Kathmandu, Nepal, the local operator will arrange flights from Kathmandu to Lukla where you start the Everest Base Camp Trek. 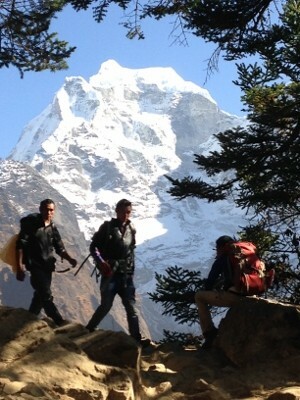 Our trekking team worked with www.EverestWeather.com to monitor weather on a regular basis. Michael Fagin was our “Weather God” and provided updates on weather forecast, potential storms, etc. throughout our trek. Ready to take the Mt. 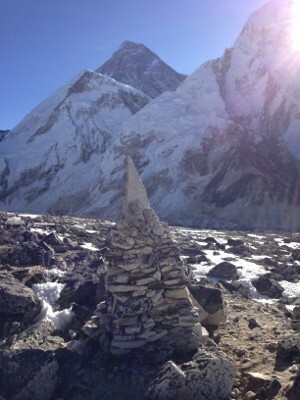 Everest Base Camp challenge? Sign up for a life changing trek, email: info@GlobalAdventuress.com for more details. 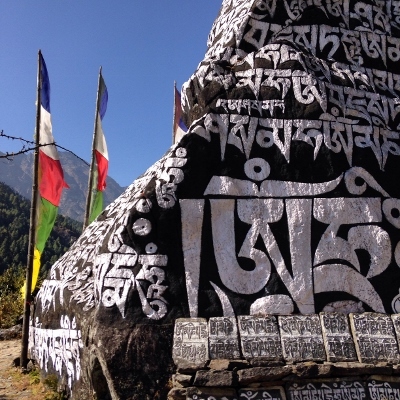 •Explore monasteries and palaces in the Kathmandu valley for two full days. 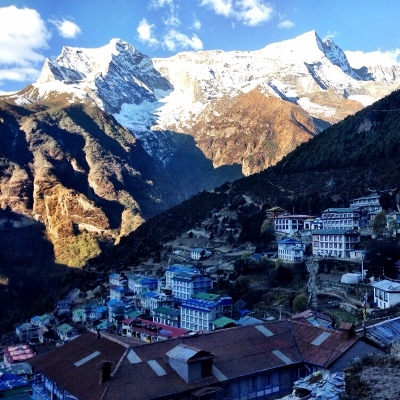 •Visit Sherpa villages including the famous Namche village. 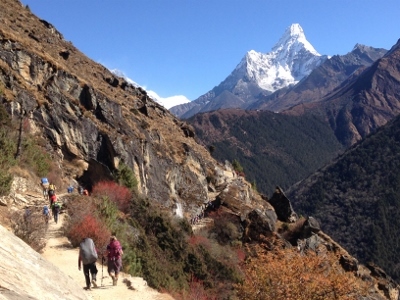 •Hike to the Everest Base Camp. 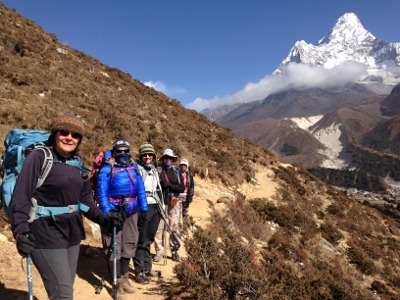 •Hike to the summit of Kala Patthar for unparalleled views of the South Face of Mt. Everest.